Thompson was known, to certain of the native peoples, as "Koo-Koo-Sint" or "the Stargazer. "1 He mapped millions of square miles of North America. Wikipedia described him as the "greatest land geographer who ever lived." At the age of 14, Thompson joined the Hudson's Bay Company and was shipped out to America to take up his post on the western shores of Hudson's Bay.2 Four years later, 1788, he was to be found at Cumberland House (On the Saskatchewan River, see Map). Time, for these far north explorers, during the winters, stretched out long with not much to do. Thompson was a man who would not allow for a waste of time, especially if there were others around him from whom he could learn. One of these was Philip Turnor, who worked for their common employer as a land surveyor.3 Thus, Thomas learned and perfected land surveying skills, notwithstanding, Thompson had, at an early point, lost the sight in his right eye. 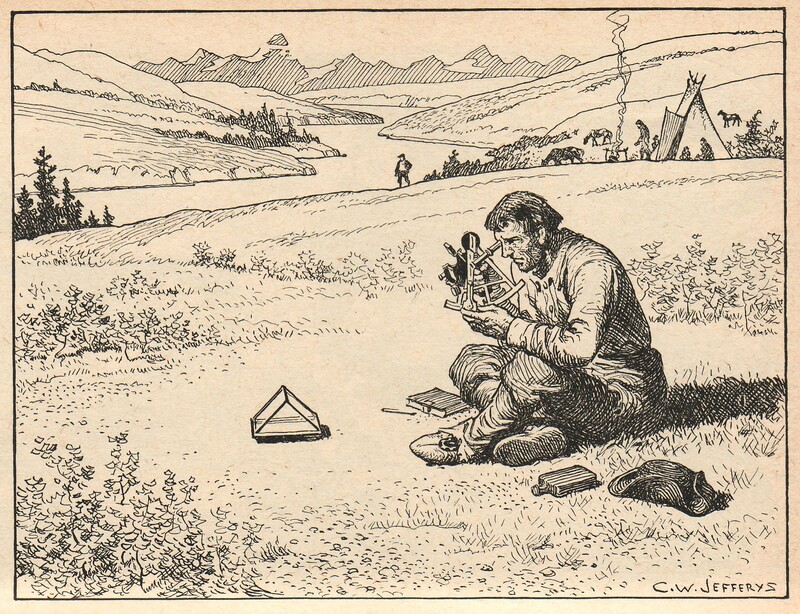 While with the Hudson's Bay Company Thompson, as a fully fledged surveyor, surveyed much of its northwestern territory including the route to and the shores of Lake Athabasca. (See Map) Thompson, however, for whatever reason, became disenchanted with his employer, Hudson's Bay Company; he left them in 1797 and joined the competition, the North West Company. 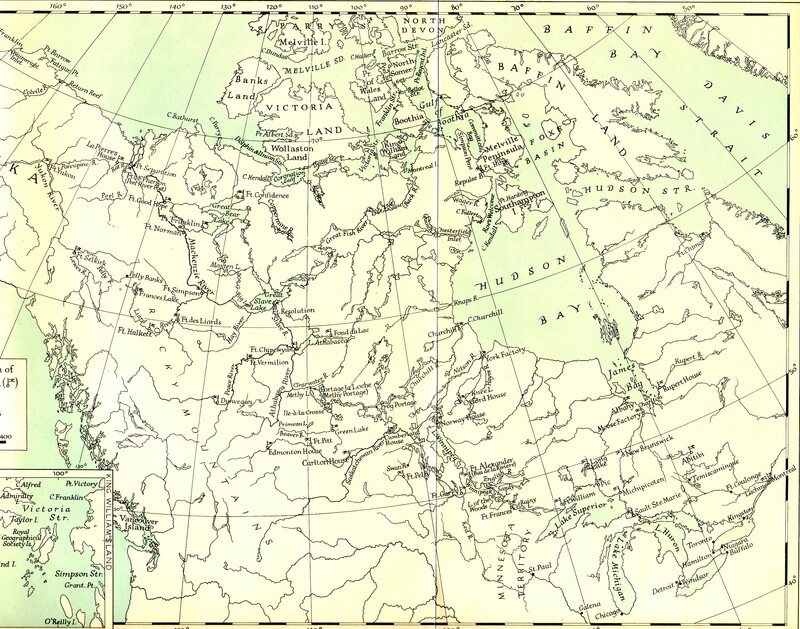 With the North West Company, Thompson continued his work as a fur trader and surveyor, and, in the process, mapped the interior of what was to become Western Canada. In 1807, Thompson crossed the Rocky Mountains and spent the summer surveying the Columbia basin, exploration which included the navigation of the entire length of the Columbia River, 1811. "... a very powerful mind, and a singular faculty of picture-making. He can create a wilderness and people it with warring savages, or climb the Rocky Mountains with you in a snow-storm, so clearly and palpably, that only shut your eyes and you hear the crack of the rifle, or feel the snow-flakes melt on your cheeks as he talks." 1 The picture is Jefferys', The Picture Gallery of Canadian History . 2 Thompson "was put to work copying the personal papers of the governor of Fort Churchill, Samuel Hearne."